Usually, online journals with open access policies ensure high visibility and maximum exposure for your work, because anyone with online access can read and further cite and promote your article. For a published article to be successful, online journals have to offer accessibility and visibility. This high level of visibility occurs with indexing, abstracting, and listing in major databases. Usually, scholarly journals with open access publishing model and policies ensure high visibility and maximum exposure for your work, because anyone with online access can read and further cite and promote your academic article. For a published article to be successful, online academic journals have to offer accessibility and visibility. This high level of visibility occurs with indexing, abstracting, and listing in major academic databases. 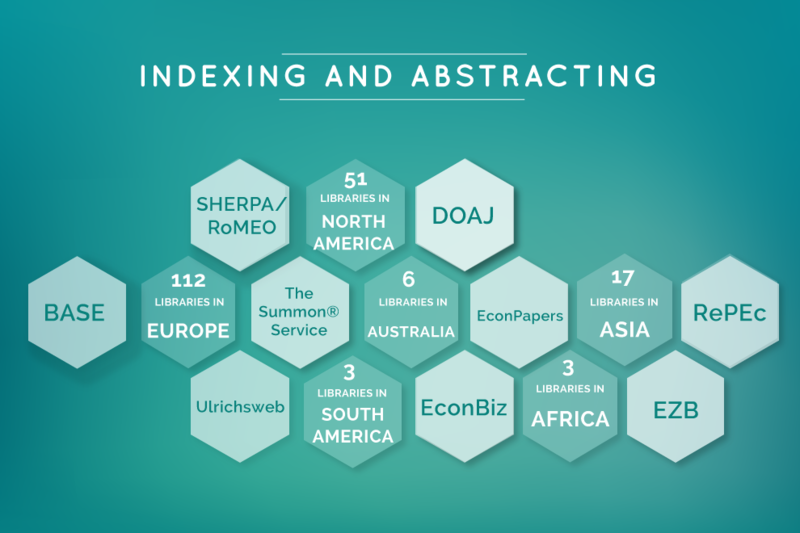 Directory of Open Access Journals (DOAJ) is a whitelist indexing service for open access scientific journals that undergo a comprehensive evaluation process. SHERPA/RoMEO is a listing service run by SHERPA Services (based at the University of Nottingham, UK) to show the copyright guidelines and open access self-archiving policies of scientific journals. RePEc (Research Papers in Economics)is the world’s largest academic database dedicated to Economics that is sponsored by the Research Division of the Federal Reserve Bank of St. Louis. EconPapers provides access to all of RePEc indexed content and is hosted by Orebro University School of Business (Sweden). EconBiz is a search portal for economics, developed by the German National Library of Economics (ZBW), that offers access to full texts on the Internet. Electronic Journals Library / EZB (Elektronische Zeitschriftenbibliothek) is a service provided by the University Library of Regensburg, Germany, meant to facilitate the use of academic journals. Created by Bielefeld University, Germany, Bielefeld Academic Search Engine (BASE) is one of the world’s most extensive multidisciplinary academic search engines especially for scholarly open access content. As part of ProQuest, The Summon® Service is a listing service provides e-resource access and management services to libraries. Ulrichsweb is a well-recognized ProQuest service as an authoritative source for bibliographic and publisher information on indexed journals, that is used by both library users and librarians. Moreover, when searching for academic articles, researchers approach the scholarly version of the most used search engine in the world, Google Scholar. To improve the degree of accessibility and visibility, the full text of all Expert Journals academic articles is instantly available to all readers and researchers without registration or subscription. This means that academic search engines, such as Google Scholar and WorldCat, can index them fully, greatly growing their visibility. At Expert Journals, we strive to offer our authors a large audience for their research papers by partnering with major indexing, abstracting, and listing academic databases. Our academic journals are currently accessible from more than 150 institutions and libraries from around the world, to increase the access and visibility of all published articles.